OTTAWA -- Scotiabank and the National Hockey League today announced that they are renewing their partnership, which began in 2007. Under the terms of the agreement, Scotiabank will continue in its role as the Official Bank of the NHL. "We have really enjoyed our work over the past five years with the NHL and have leveraged this partnership as Canada's Hockey Bank to create some great fan experiences for our customers and the communities where we live, work and play," said Anatol von Hahn, Scotiabank Group Head, Canadian Banking. "On behalf of Scotiabank hockey fans from coast to coast, I am very pleased to be continuing in our role as the Official Bank of the NHL. We look forward to bringing Canadians more new and unique hockey experiences." The "Celebration of Hockey" series that has taken the Stanley Cup to more than 75 communities. In 2012 alone, the Scotiabank Community Hockey Sponsorship Program, part of the Scotiabank Bright Future philanthropic program that has subsidized hockey for 70,000 youth, ages 7 to 14. Scotiabank Hockey Day in Canada on CBC that happens once a year, based in one Canadian community with remote locations across the country and hockey played from coast to coast including Canadian NHL teams. 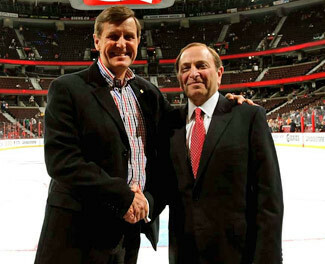 "The NHL is pleased to renew its partnership with Scotiabank," said John Collins, Chief Operating Officer, NHL. "Scotiabank has a long history of supporting hockey on all levels in communities across Canada, and we have been proud to be their partner on very innovative and exciting grassroots hockey experiences over the past five years. These community based hockey programs enrich the lives of NHL fans and hockey enthusiasts from coast to coast." "In big arenas or on small ponds, hockey is part of the richness of life for so many Canadians, and Scotiabank employees across Canada have really rallied behind our hockey program," said Duncan Hannay, Senior Vice President Marketing, Scotiabank. "We are proud to renew our partnership with the NHL and look forward to providing many more years of exciting hockey experiences." In addition to being the Official Bank of NHL, NHLPA, NHL Alumni and the CWHL, Scotiabank has partnerships with four Canadian NHL teams (Official Bank of the Calgary Flames, Ottawa Senators, Winnipeg Jets and Toronto Maple Leafs, partner on select initiatives with the Montreal Canadiens) two professional arenas (Scotiabank Saddledome in Calgary and Scotiabank Place in Ottawa) and two American Hockey League teams (St. John's Ice Caps and the Toronto Marlies).